Oh Lifetime, why must you do this? Your lane is made-for-TV movies produced a decade too soon and six months too quickly that are perfect for live tweeting and you do it well. Stick to that, because when you try too hard we end up with programs like Girlfriend Intervention which premieres tonight. 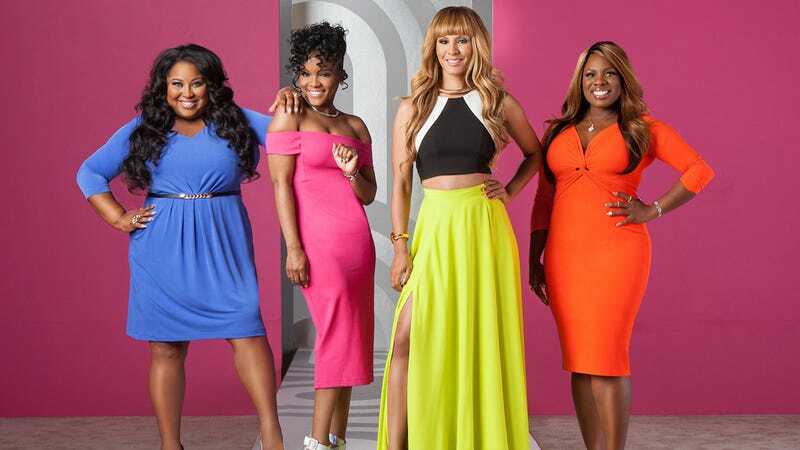 Girlfriend Intervention is a makeover show in which four sassy black women turn mousy white women, who they call a BWs for "basic woman," from "a red hot mess" to "a bootylicous babe." Are you cringing yet? The tagline of the show is, "Trapped inside of every white girl is a strong black woman ready to bust out," to which I say hell no. I'm not going to say this again: Having an "inner black woman" is not a thing. Consider this the official funeral for the phrase because we are banishing it from our national lexicon from this day forward. The only people who have an inner black woman are black women. And even then, we just call it "being ourselves and living our lives." NPR's Linda Holmes points out that not only is the premise of the show offensive to black women, but to white women as well, who apparently are unable to dress themselves without the help of a fast talking black girlfriend. Thomas' work seems to be one of the "twists" that separates this from other makeover shows. Throughout the series, the four women will be taking their BWs to learn burlesque, double dutch, African dancing and of course, of course, how to rap. You know, all the common hobbies of us black ladaaays. Perhaps what I hate most about this concept is that even as the presumed stars of the series, these four black women are still being relegated to the "sassy black friend" category. Regardless of the billing, their only purpose in each episode is to help some random white girl, who then becomes the protagonist. At least with something like the Real Housewives of Atlanta those women are the true stars of show. Black woman are already underrepresented on television, (as are many different groups) so it's particularly frustrating when they're only given screen time on reductive tropes like this. If black women were getting work across a number of successful network and cable television shows right now, this wouldn't be as bothersome. In the same way that I doubt many white people are particularly bothered by Here Comes Honey Boo Boo, because, sure, that exists, but you also have Alicia Florrick, Carrie Mathison, Rust Cohle and Martin Hart. I don't know these women and I can't speak for them, but I'm guessing HGTV isn't exactly knocking down Nikki Chu's door begging her to host a new home decor show. Would Tiffiny Dixon like to do a fashion makeover show like What Not to Wear without all the forced sassy quips? Perhaps. But no, they get offers to do Girlfriend Intervention. I'm going to watch the premiere tonight with my fingers crossed that it won't be as bad as it seems. I'm a big fan of silly reality television because it really can be fun and clever in its own way and Girlfriend Intervention certainly has the potential to be that. But, from finding your inner black woman to making white girls rap to get in touch with their "blackness," there's a lot to look past.